FULLY RECLINABLE WITH UNIVERSAL SLIDERS. Fully reclinable with universal slider. BLACK PVC LEATHER WITH RED STITCHING. Made of high quality black PVC leather with red stitching. 1 PASSENGER SIDE RACING SEAT. FULLY RECLINABLE WITH UNIVERSAL SLIDERS. - Fully reclinable with universal sliders. 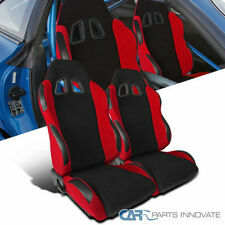 1 PAIR OF JDM RACING SEATS 2 PIECES OF RACING STYLE 4-POINT SEAT BELTS/HARNESS. BLACK/RED CLOTH MATERIAL WITH PVC LEATHER PATCHES. FULLY RECLINABLE WITH UNIVERSAL SLIDER. Fully reclinable with universal slider. Slider length : 14.25"~19.25". BLACK/RED SUEDE WITH PVC LEATHER PATCHES. Made by high quality black/red cloth material with PVC leather patches. Slider length : 14.25"~19.25". BLACK/RED CLOTH MATERIAL WITH PVC LEATHER PATCHES RACING SEATS. - Made by high quality black/red cloth material with PVC leather patches. - 4-point racing harness pass through. FULLY RECLINABLE WITH UNIVERSAL SLIDERS. Fully reclinable with universal sliders. 1 PAIR OF JDM RACING SEATS. 4-point racing harness pass through. BLACK & BLUE CLOTH MATERIAL. SPECDTUNING INSTALLATION VIDEO: Spec-D UNIVERSAL RACING SEAT. FULLY RECLINABLE RACING SEATS WITH UNIVERSAL SLIDERS. - Fully reclinable with universal sliders. BLACK/RED CLOTH MATERIAL WITH PVC LEATHER PATCHES RACING SEATS. - Made by high quality black/red cloth material with PVC leather patches. FULLY RECLINABLE WITH UNIVERSAL SLIDERS. Fully reclinable with universal sliders. Slider length : 14 ¼ "~19 ¼ ". ROYAL BLUE & BLACK CLOTH MATERIAL. Made of high quality royal blue & black cloth material. FULLY RECLINABLE WITH UNIVERSAL SLIDERS. Fully reclinable with universal sliders. 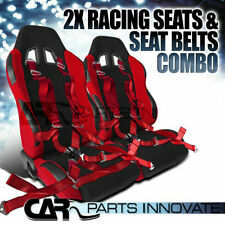 1 PAIR OF JDM RACING SEATS 2 PIECES OF RACING STYLE 4-POINT SEAT BELTS/HARNESS. BLACK HEAVY-DUTY NYLON SEAT BELTS. Racing seats. FULLY RECLINABLE WITH UNIVERSAL SLIDER. Fully reclinable with universal slider. Slider length : 14.25"~19.25". 1 DRIVER SIDE RACING SEAT. BLACK/GRAY CLOTH MATERIAL. Made by high quality black/gray cloth material. FULLY RECLINABLE WITH UNIVERSAL SLIDER. Fully reclinable with universal slider. Slider length : 14.25"~19.25". 1 PASSENGER SIDE RACING SEAT. BLACK/GRAY CLOTH MATERIAL. Made by high quality black/gray cloth material. FULLY RECLINABLE WITH UNIVERSAL SLIDER. Fully reclinable with universal slider. Slider length : 14.25"~19.25". BLACK/GRAY CARBON LOOK CLOTH MATERIAL. Made by high quality black/gray carbon style cloth material. SFI 16.1 certified. 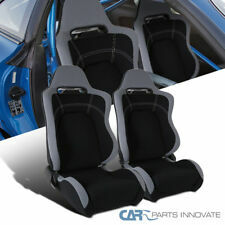 FIT FOR MOST VEHICLES WITH RACING SEATS FEATURE FOR 5-POINT SEAT BELT INSTALLATION. 1 PIECE OF RACING STYLE 5-POINT SEAT BELT/HARNESS. BLACK HEAVY-DUTY NYLON. SPORTY RACING STYLE. SFI 16.1 certified. FIT FOR MOST VEHICLES WITH RACING SEATS FEATURE FOR 5-POINT SEAT BELT INSTALLATION. 1 PIECE OF RACING STYLE 5-POINT SEAT BELT/HARNESS. SPORTY RACING STYLE. 5 point bolt in mounting design. SFI 16.1 certified. 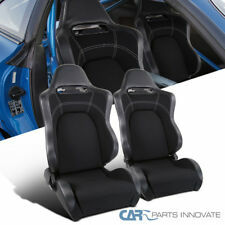 FIT FOR MOST VEHICLES WITH RACING SEATS FEATURE FOR 5-POINT SEAT BELT INSTALLATION. GREEN HEAVY-DUTY NYLON. 2 PIECES OF RACING STYLE 5-POINT SEAT BELTS/HARNESS. SPORTY RACING STYLE. FULLY RECLINABLE WITH UNIVERSAL SLIDERS. Fully reclinable with universal slider. Slider length : 14.25"~19.25". BLACK/BLUE PVC LEATHER. Made by high quality black/blue PVC leather. 1 DRIVER SIDE RACING SEAT. SFI 16.1 certified. BLACK HEAVY-DUTY NYLON. FIT FOR MOST VEHICLES WITH RACING SEATS FEATURE FOR 5-POINT SEAT BELT INSTALLATION. 2 PIECES OF RACING STYLE 5-POINT SEAT BELTS/HARNESS. Provides comfort, support and safety during hard cornering and aggressive driving. SFI 16.1 certified. FIT FOR MOST VEHICLES WITH RACING SEATS FEATURE FOR 5-POINT SEAT BELT INSTALLATION. 1 PIECE OF RACING STYLE 5-POINT SEAT BELT/HARNESS. BLUE HEAVY-DUTY NYLON. SPORTY RACING STYLE. Provides comfort, support and safety during hard cornering and aggressive driving. FULLY RECLINABLE WITH UNIVERSAL SLIDER. Fully reclinable with universal slider. Slider length : 14 ¼ "~19 ¼ ". ROYAL BLUE & BLACK CLOTH MATERIAL. Made by high quality royal blue & black cloth material. FULLY RECLINABLE WITH UNIVERSAL SLIDERS. Fully reclinable with universal slider. Slider length : 14.25"~19.25". BLACK/BLUE PVC LEATHER. Made by high quality black/blue PVC leather. 1 PASSENGER SIDE RACING SEAT. SFI 16.1 certified. 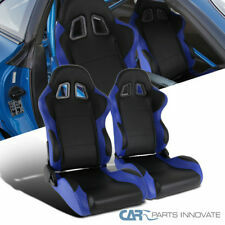 FIT FOR MOST VEHICLES WITH RACING SEATS FEATURE FOR 5-POINT SEAT BELT INSTALLATION. 2 PIECES OF RACING STYLE 5-POINT SEAT BELTS/HARNESS. BLUE HEAVY-DUTY NYLON. SPORTY RACING STYLE. SFI 16.1 certified. FIT FOR MOST VEHICLES WITH RACING SEATS FEATURE FOR 5-POINT SEAT BELT INSTALLATION. 2 PIECES OF RACING STYLE 5-POINT SEAT BELTS/HARNESS. SPORTY RACING STYLE. 5 point bolt in mounting design. SFI 16.1 certified. FIT FOR MOST VEHICLES WITH RACING SEATS FEATURE FOR 5-POINT SEAT BELT INSTALLATION. GREEN HEAVY-DUTY NYLON. 1 PIECE OF RACING STYLE 5-POINT SEAT BELT/HARNESS. SPORTY RACING STYLE.